With vehicle details so we can help ensure this part fits your vehicle - we aim to respond within 2 working hours. 7.03703.01.0, 703703010. AUDI A2 (8Z0) 1.4. Engine Code: BBY, Engine Code: AUA, Supplementary Article/Supplementary Info 2: with vacuum bypass. SEAT IBIZA Mk II (6K1) 1.4 16V. SEAT IBIZA Mk III (6L1) 1.2. Engine Code: AZQ, Supplementary Article/Supplementary Info 2: with vacuum bypass. SEAT IBIZA Mk III (6L1) 1.4 16V. Engine Code: BBY, Supplementary Article/Supplementary Info 2: with vacuum bypass. SEAT LEON (1M1) 1.4 16V. Engine Code: APE, Engine Code: AXP, Supplementary Article/Supplementary Info 2: with vacuum bypass. SKODA FABIA I (6Y2) 1.2. SKODA FABIA I Combi (6Y5) 1.2. SKODA FABIA I Praktik (6Y5) 1.2. SKODA FABIA I Saloon (6Y3) 1.2. SKODA OCTAVIA I (1U2) 1.4 16V. Engine Code: AXP, Engine Code: BCA, Supplementary Article/Supplementary Info 2: with vacuum bypass. SKODA OCTAVIA I Combi (1U5) 1.4 16V. SKODA OCTAVIA II (1Z3) 1.4. Equipment Variant: WITH ACCELERATOR PED. VW CADDY Mk II (9K9A) 1.4. From Engine Number: AUD 020 028, Supplementary Article/Supplementary Info 2: with vacuum bypass. VW GOLF Mk IV (1J1) 1.4 16V. , , , , , Engine Code: AXP, Engine Code: BCA, Engine Code: APE, Supplementary Article/Supplementary Info 2: with vacuum bypass. VW GOLF Mk IV Estate (1J5) 1.4 16V. , Engine Code: APE, Engine Code: BCA, Supplementary Article/Supplementary Info 2: with vacuum bypass. VW GOLF PLUS (5M1, 521) 1.4 16V. VW GOLF V (1K1) 1.4 16V. VW LUPO (6X1, 6E1) 1.4 16V. Engine Code: APE, Engine Code: AUA, Engine Code: BBY, Supplementary Article/Supplementary Info 2: with vacuum bypass. VW NEW BEETLE (9C1, 1C1) 1.4. Supplementary Article/Supplementary Info 2: with vacuum bypass. VW NEW BEETLE Convertible (1Y7) 1.4. VW POLO (6N2) 1.4 16V. From Engine Number: WVWZZZ6NZY-500001, Engine Code: APE, Engine Code: AUA. VW POLO (9N_) 1.2 12V. From Engine Number: WVWZZZ9NZ2-000001, Engine Code: AZQ, Supplementary Article/Supplementary Info 2: with vacuum bypass. VW POLO (9N_) 1.4 16V. VW POLO CLASSIC (6V2) 75 1.4 16V. Engine Code: APE, Engine Code: AUA, Supplementary Article/Supplementary Info 2: with vacuum bypass. Cambiare, the vehicle electronics specialist, is dedicated to providing the aftermarket with OE quality and BER compliant parts. Its emphasis on quality and range development has resulted in a product offering sourced from across the globe. 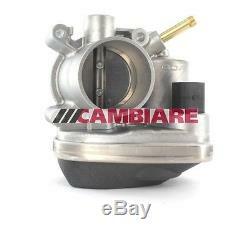 The item "Throttle Body VE387027 Cambiare 036133062L Genuine Top Quality Replacement New" is in sale since Tuesday, July 18, 2017. This item is in the category "Vehicle Parts & Accessories\Car Parts\Air Intake & Fuel Delivery\Throttle Bodies". The seller is "carpartsinmotion" and is located in Leeds, United Kingdom. This item can be shipped to all countries in Europe, Antigua and barbuda, Australia, United States, Canada, Brazil, Japan, New Zealand, China, Hong Kong, Indonesia, Malaysia, Mexico, Singapore, South Korea, Taiwan, Thailand, Bangladesh, Belize, Bermuda, Bolivia, Barbados, Brunei darussalam, Cayman islands, Dominica, Ecuador, Egypt, Guadeloupe, Grenada, French guiana, Jordan, Cambodia, Saint kitts and nevis, Saint lucia, Sri lanka, Macao, Maldives, Montserrat, Martinique, Nicaragua, Oman, Pakistan, Peru, Paraguay, Reunion, Turks and caicos islands, Aruba, Saudi arabia, South africa, United arab emirates, Chile.